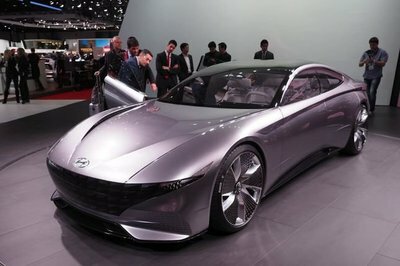 Geneva, Switzerland - March 13, 2018 - Hyundai's been making some serious behind the scenes strides since former Bentley design director Luc Donckerwolke and exterior design chief Sangyup Lee joined the company back in 2016. 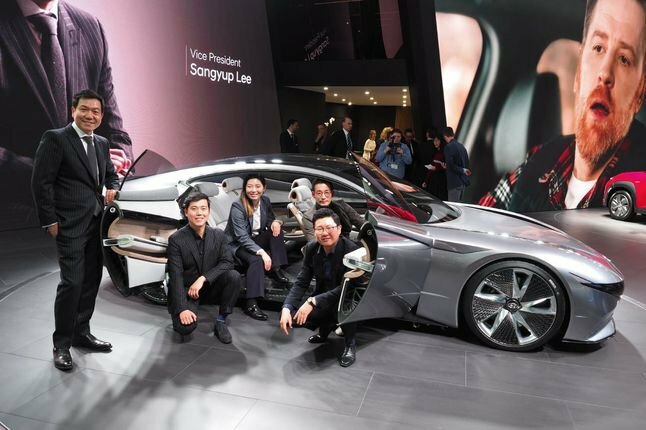 Now Senior Vice President of Design at Hyundai (Donckerwolke) and Vice President of Hyundai Design (Lee), the designers are responsible for leading the charge into the next era for the Korean brand. This can be seen in the Hyundai Le Fil Rouge Concept, which made its surprise debut in Geneva. Hyundai Le Fil Rouge Concept. Hyundai’s been making some serious behind the scenes strides since former Bentley design director Luc Donckerwolke and exterior design chief Sangyup Lee joined the company back in 2016. Now Senior Vice President of Design at Hyundai (Donckerwolke) and Vice President of Hyundai Design (Lee), the designers are responsible for leading the charge into the next era for the Korean brand. This can be seen in the Hyundai Le Fil Rouge Concept, which made its surprise debut in Geneva. An introduction to the brand’s latest approach in design, the Fil Rouge concept encapsulates a ‘sensuous and sportiness’ theme that will embody all future Hyundai vehicles, from sedans to SUVs, in a unique way. The goal of the theme is to bring instinctive beauty to the Hyundai range while creating emotional value and desirability. The Le Fil Rouge concept is a massive statement of intent from the Korean manufacturer and a very well executed one at that. The exterior design features a host of innovations for Level 4 autonomous diving cleverly integrated into a traditional typology, but it’s beautiful detailing, aircraft-inspired construction and interior execution is anything but traditional. “Le Fil Rouge is our design vision concept,” says Hyundai VP of design Sangyup Lee. The concept injects a great deal of visual interest into the D-segment typology, which has been dwindling as myriad SUVs have usurped the once thriving sector. The exterior design brings the typology firmly into the future with a variety of elegant design elements, exceptional detail and emotional surface changes. 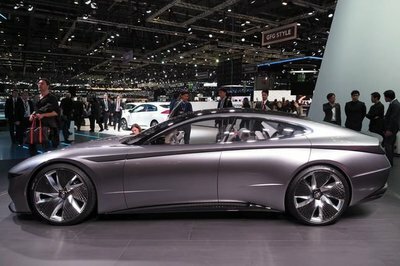 To emphasize Hyundai’s newfound electric vehicle design mission, Lee says the overall design is defined by the harmony between four fundamental elements: proportion, architecture, design and technology. “Technology is very important,” says Lee. The front end features a wide, cascading grille with triangular shapes and LED lighting. It’s been specifically designed around the technology, acting as a visual indicator that changes the car’s DRG depending on the mode in which the car is driven. The tiny LEDs have been specifically designed for when the car is in autonomous mode, for example. The same idea applies to the bodyside of the car, where the soft shoulder and sharp undercut is joined by what Lee calls “light architecture”. When the car is in autonomous mode, the light below the undercut illuminates to emphasize the bodyside volumes of the car. “It’s like a tall building in Shanghai,” Lee says of the design inspiration. The DLO surround also incorporates lighting to draw attention to the vehicle, highlighting it is in autonomous mode. 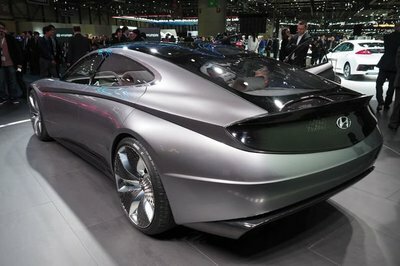 The proportions of the car are characterized by its long wheelbase and short front and rear overhangs, which have been made possible thanks to the Fil Rouge concept’s EV platform. This has also enabled the designers and engineers to maximize the cabin volume. The roofline plunges rearward into the short decklid while the glazed roof itself features a double bubble -- similar to vehicles created by Italian design house Zagato – to optimize aerodynamics. 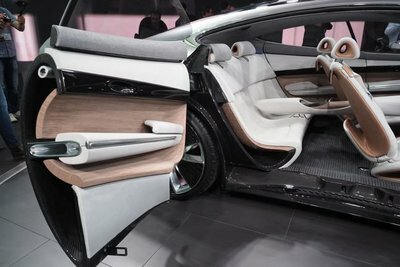 But while the exterior of the Fil Rouge concept was full of incredible detailing and unique design elements that blend technology with aesthetic appeal, the interior takes the design to another level. A ‘tube architecture’ merges the interior with the exterior. Inspired by airplane construction the underlying principle was to create the same emotional value inside and outside the vehicle, while also allowing for a lightweight profile. 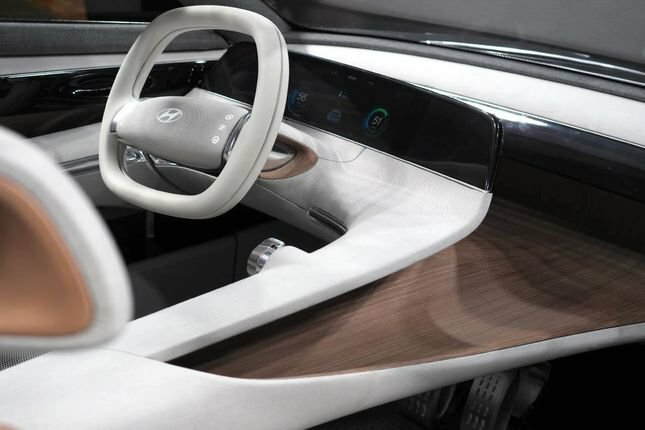 The interior design differentiates between the needs of both the driver and passengers. 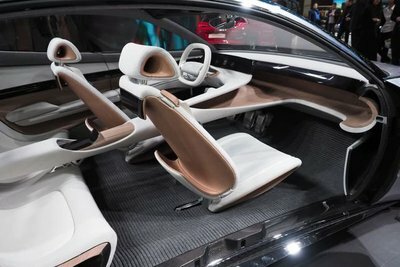 The front passenger seat was designed to maximize comfort on long-distance trips, while the driver’s seat was tailored to emphasize the driving experience and optimized ergonomics. 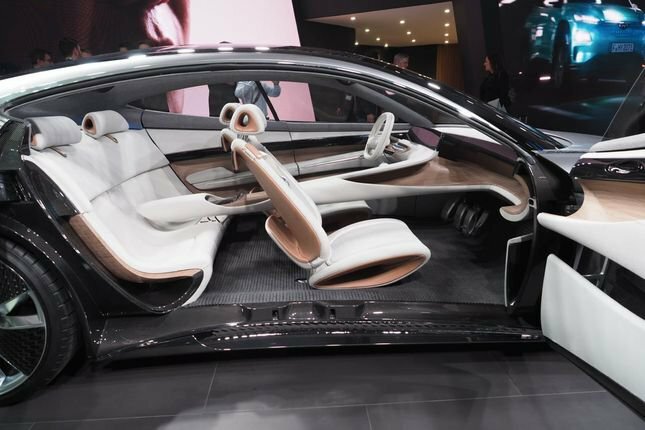 A panoramic floating display coupled with haptic technology sits in front of the driver, providing access to intuitive controls for climate control and other vehicle configurations. This is operated through the steering wheel. Made from aluminum, carbon fiber and wood, the material use within the car and the way it is so beautifully integrated is nothing short of exceptional. Adding to the future design narrative is the fact that they’re all sourced sustainably, from recycled materials. 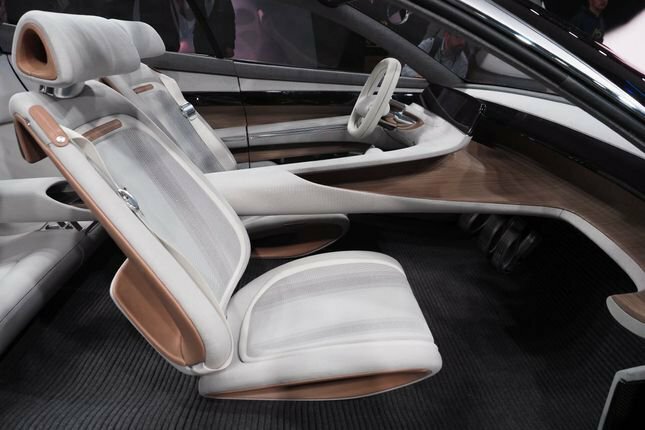 The wraparound architecture of the IP, finished in a light-colored ‘revitalized’ wood emphasizes cabin depth while creating a calm, spacious and comfortable travel environment, while high-tech fabrics are used extensively throughout and sculpted into sensuous forms. The goal was to create a design that enables a seamless experience of function, which Hyundai’s design team has undoubtedly achieved. Hyundai’s sensitivity to design, material use and technology is perfectly integrated into the concept. And that’s why the Le Fil Rouge was one of the stars of the show.